Teknova provides custom manufacturing services for both research and commercial applications. Bulk packaging and custom formatting are available. OEM packaging and private labeling services are offered for commercial applications. Our capabilities include bottling, vialing, kit assembly, etc… Our facility allows us to rapidly manufacture media exactly to your specification. Any combination of antibiotics, dyes, growth supplements, etc… can be added. 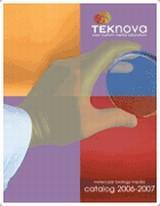 Teknova manufactures standard and custom liquid reagents. Typical batch volumes range from 1 litre to 500 litres. ACS, reagent, and ultra pure grades of chemicals are used in the manufacture of all products. Sterile products are packaged in class 10,000 laminar flow hoods. Column chromatography for product purification is available to a scale of 48 liters media.